Sneakerness x Filling Pieces Low Top Sneaker "Moulin Rouge"
Filling Pieces is no stranger to collaborations. As their popularity grows, more people are starting to see the potential Filling Pieces brings to the fashion/sneaker world. Their latest collaboration works with Parisian retailer, Sneakerness. Releasing the Sneakerness x Filling Pieces Low Top Sneaker "Moulin Rouge," this collab is inspired by the famous cabaret in Paris. The Sneakerness x Filling Pieces Low Top Sneaker "Moulin Rouge" is dressed in a completely red leather appearance really standing out from the rest. 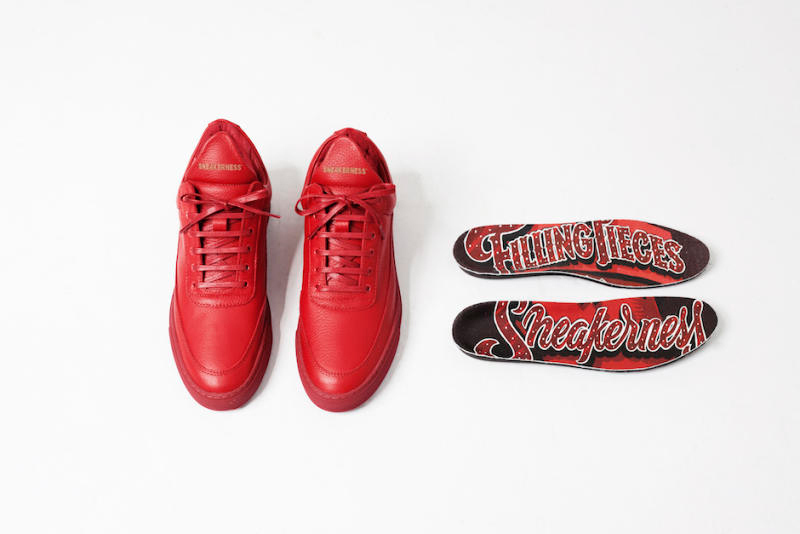 Gold branding on the tongue and heel compliments the red appearance as the sneaker is finished off with dual branding in Moulin Rouge style writing on the insole. Releasing September 7th, let us know what you think of the sneaker below!